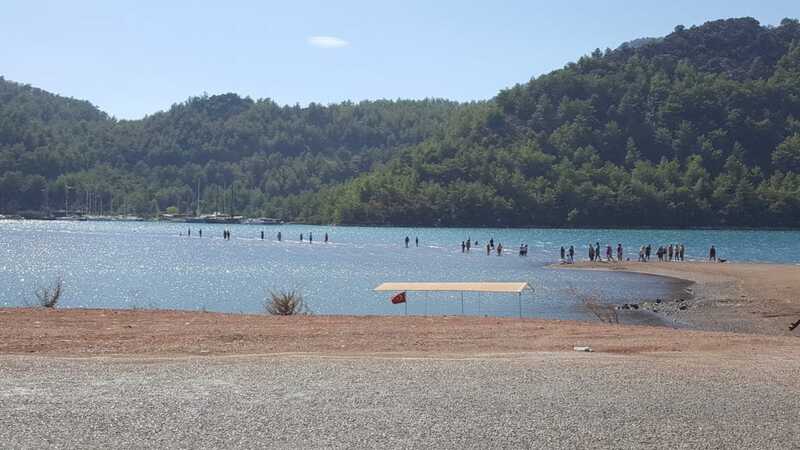 If your plans to enjoy a peaceful and scenic yacht charter vacation in Turkey, a beautiful local region such as the Gulf of Hisaronu is a great area to consider. Equally the Gulf of Gokova is just as stunning with clear and clean waters, plenty of private bays and little coves to unwind at. During the high season months, these two areas offer a pleasant strong breeze that comes from the north called the Meltemi winds. 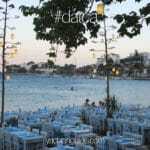 The winds are strong but in the heat of the summer it feels nice after a swim in the Southern Aegean waters. Although these winds can create for rough seas, it also makes for clear blue skies and a rich blue sea. Weather typical for the Meltemi is that there isn’t any humidity and the air is very dry and visibility is very clear which is fantastic because you can see your stunning environment in a completely different perspective. The sea might get sometimes a bit wavy but this will give that little bit of extra dimension to your blue cruise, especially when you sit on the bow and the Meltemi is blowing through your hair! Travelers have a variety of options for Turkish yachts (gulets) to enjoy these areas. For instance, if you happened to be a medium to large sized group, you may prefer a sturdy gulet to during this windy season. Two such example gulets are the S Nur duo. The S Nur 1 gulet is the predecessor of the 2012 build S Nur Taylan gulet. Sometimes travelers feel good about hiring a gulet that has a gulet owner of other gulets. It provides that added confidence, knowning that there is already one established gulet charter owned by the same person or company. 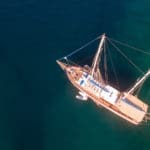 While the S Nur 1 gulet was built in 2006, she has been well kept and maintained over the years – and 2006 isn’t really considered an old gulet when there are ones that are still being chartering dating back to the mid to late 90’s. At 28 meters, this Turkish yacht charter offers comfortable accommodation for up to 16 guests with air conditioning and en suites – and reasonable priced. 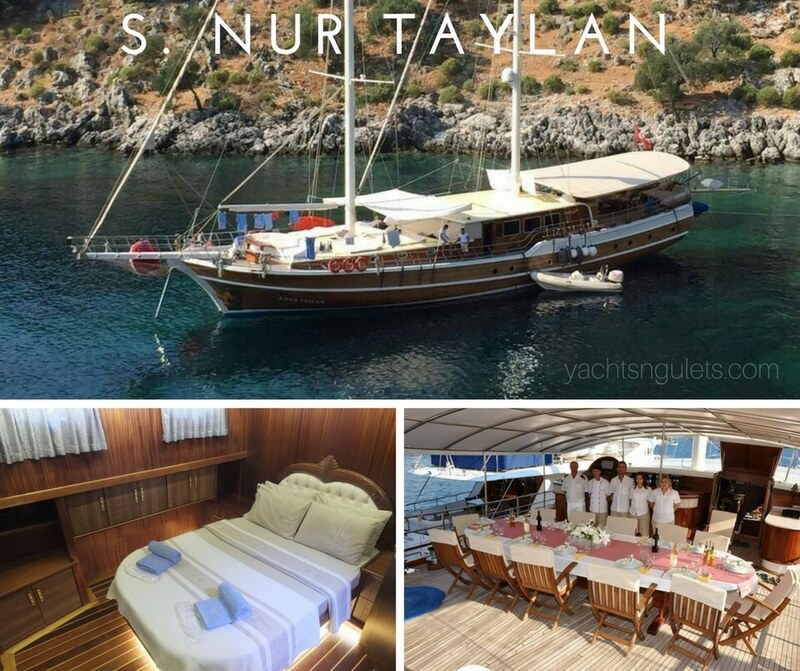 The S Nur Taylan gulet is an altogether much larger gulet with modern facilities, an excellent assortment of water toys with a powerful tender outboard engine of 100hp. 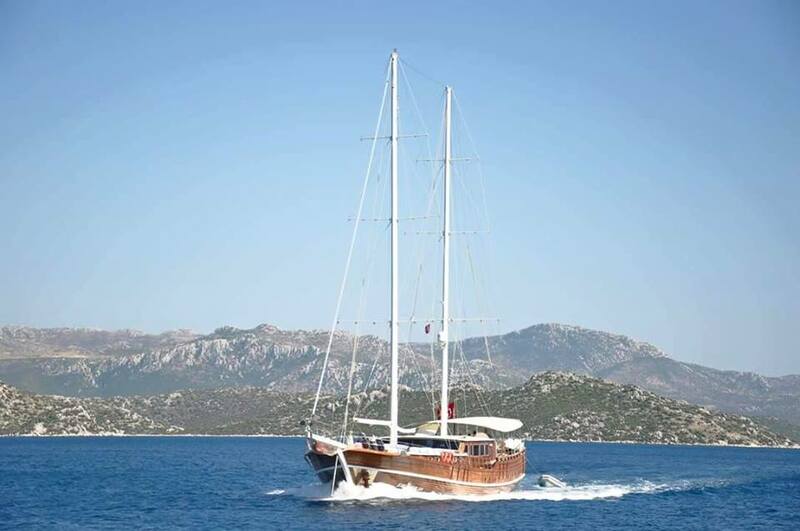 This 32 meter gulet was a success in her first charter season, and now asked for by name. 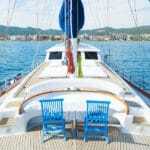 Like the S Nur 1 gulet, she too provides cabin accommodation for up to 16 as well. 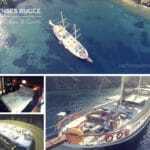 This Turkish yacht charter is reputed for super dishes, an experienced, trained, and well-liked crew.